A side-by-Side Baking experiment looking at how three different butters can affect the flavour and colour of a basic sponge. I’m sure that you’ve read in many recipe books and food magazines the phrase ‘buy the best you can afford‘. It’s a phrase used to refer to all manner of ingredients; flour, chocolate, butter, and other general food stuff. But does more expensive actually mean better quality and flavour? Or are those extra pennies simply paying for fancy packaging and marketing? It therefore occurred to me to undertake a little side-by-side baking experiment to look at a commonly used baking ingredient, butter, to try to determine if the extra money spent on a more expensive brand is actually worth it. Now to be honest, I usually purchase the supermarket’s own mid-range unsalted butter for my baking. Not only is there quite a difference in price compared to branded butters but as my mum said, when she assisted in my taste test, “surely butter is butter”, meaning aren’t they all the same anyway? This particular Side-by-Side Baking experiment is designed to, hopefully, help me decide if there is any appreciable difference in a baked product when using a more expensive butter. The supermarket shelves are packed full of different butters; there are expensive butters wrapped in quality papers printed with detailed bios of the product through to the cheaper supermarket own range where the dairy fat is wrapped in a relatively plain paper which shares minimal information. Now clearly my little blog, and Mr E’s and my waistlines, would be unable to handle a comparison post of each and every butter commonly available here in the UK, so we restricted this comparison bake to 3 different butters. We chose products which aimed to give a broad idea of the wide varieties available and therefore selected: a supermarket own brand butter, a French butter and a butter from a local creamery. Clearly, though, there is a huge range of butter available and other products not tested here may be as good if not better. 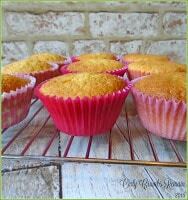 The three butters selected were then put to use by incorporating them in a common household bake; the cupcake. Which three butters did I use? As I mentioned above I tried to select a broad range of butters commonly available here in the UK. Firstly. I bought a supermarket own butter. This was from Asda. The packaging states that the butter is from British dairy farms and contains a minimum of 80% milk fat. It is an unsalted butter and cost just 79p. Secondly, I chose a butter from a well known creamery here in the UK, Wensleydale Creamery. It is made in the Yorkshire Dales where is it traditionally churned. It is described as ‘rich and creamy‘. The fat content is shown as 82.2% and the 250g block cost £1.60. As this is a salted butter I added a pinch of salt to the other two batters to make the experiment a fairer comparison . Lastly, I purchased a French butter called President. I have read in a few places of the quality of French butters and the flavours they bring to baked goods. The wrapper informs us that this butter was made in the heart of Normandy with the ‘finest milk and cream‘. It states that it is ‘delicious in sponge cakes or buttercream and perfect for savoury pastries and sauces‘. The fat content is shown as 82% and it cost £1.55. This is an unsalted butter. I decided to compare the three butters in a straightforward and commonly made sponge, the Victoria. The sponge was unflavoured and undecorated to allow my volunteers to taste the sponge more clearly. I made three different batches of the batter, incorporating a different butter in each. All three batches of the sponge was made using the creaming in method. A small pinch of salt was added to the two batters whose butter didn’t include any salt. I aimed to ensure the eggs used in the three batches carried the same richness of colour. One batch was made and baked before starting the next batch so as not to affect the sponges waiting for oven space. 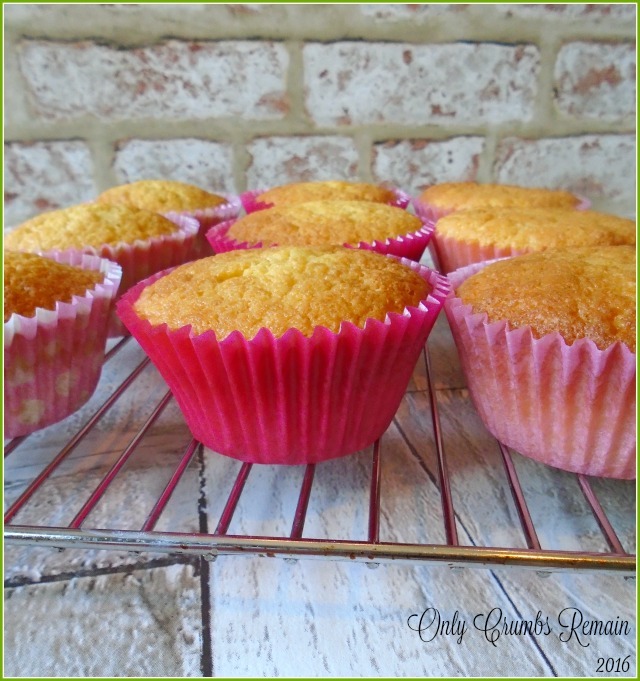 The muffin tray was positioned in the same part of the oven for all three bakes and as each cupcake weighed the same they all were baked at the same temperature and the for the same period of time. Different patterned paper cases were used for the three batches, thus preventing them from being muddled up. Three of the five tasters, including myself, agreed with the preferred cupcake. We also ranked each of the three bakes the same. 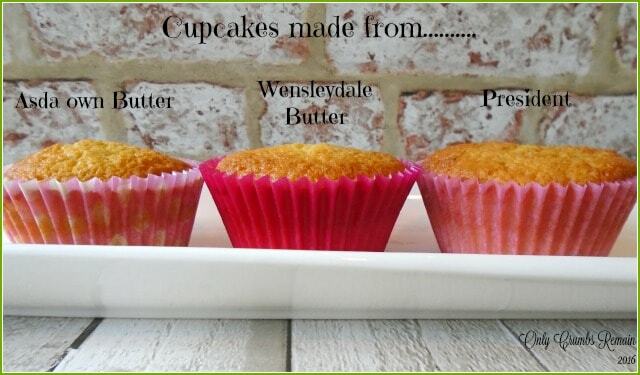 The winning butter, according to the three tasters, was from the Wensleydale creamery. Second was President leaving the cheaper supermarket butter in last place. That’s a 60% agreement. The other two tasters didn’t notice any appreciable difference. Clearly this is quite a subjective baking experiment and not everybody will agree with the outcome, but I feel that a 60% complete agreement is a result worth sharing. The enhanced flavour may be more evident in pasties, particularly puff pastry, where the fat content is higher. it is worth pushing the boat out to purchase a quality butter. 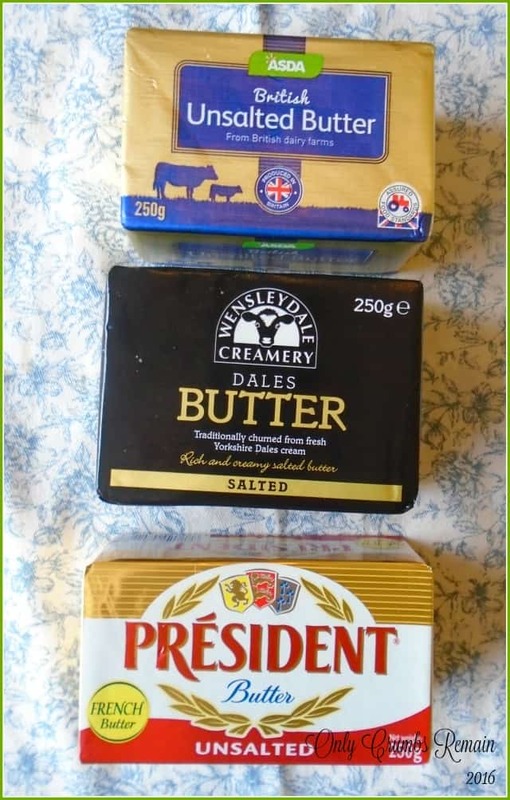 From the outset of undertaking this particular baking experiment, I have been quite surprised and this has led me to do a little internet surfing regarding the differences in butter. As soon as I peeled away the wrappers from the butter pats I noticed a marked difference between the three butter’s colour. The Wensleydale creamery butter was a beautiful deep creamy yellow colour whereas the French product was incredibly pale. The Asda own brand butter also showed a nice creamy colour, though certainly not as deep as that from the creamery. Wikipedia explains that butter’s unmodified colour is dependent upon the animal’s feed however it does go on to say that it is commonly manipulated with food colourings in the commercial manufacturing process, usually with annatto or carotine. 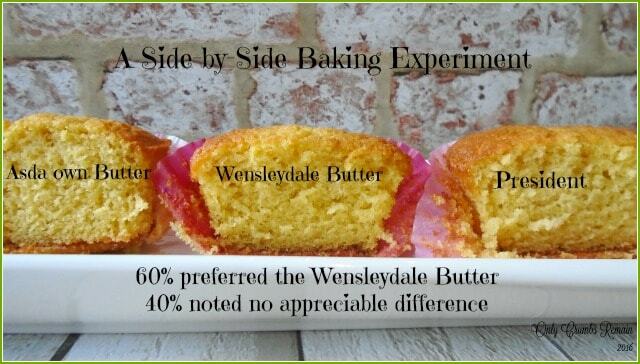 It is perhaps worth considering the fact that the Wensleydale creamery (the ‘winner’ of this baking comparison) is located in the Yorkshire Dales, where the rolling hills and lush green grass spread for miles. An article entitled ‘The Colour of Butter’ written by Chefs Culinar explains this further. The author explains that grass contains a lot of carotenoids, and as these caratenoids are fat soluble they are transferred to the milk fat and therefore the butter. If the cows are fed concentrated feed and hay during the winter months and have little access to grass the resultant butter is far whiter in colour. Although these colour manipulators aren’t identified within the ingredients list, I am unsure if the manufacturer has a legal obligation to list them anyway. 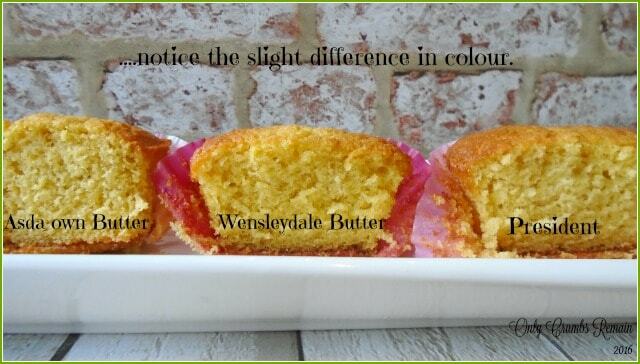 It’s interesting to see in the cupcake cross-section image that the sponge made from the Wensleydale butter actually shows a slightly deeper enriched colour than the other two bakes. (I can confirm that the colour of the eggs – specifically the egg yolks – was the same in all three bakes). The PH and acid values of the cream used can differ. A natural flavour is often added to unsalted cultured butters. There are differences in how the butter is processed and preserved which is likely to also affect the flavour. Having done this little side-by-side experiment, I can already see a few more are needed to be carried out regarding butter! Do you have a preferred butter? each muffin to ensure equal sizes. Each cupcake will weigh about 64g. Once the cupcake sponges are cold decorate your bake as desired, perhaps with a water icing, butter cream or a chocolate glaze. 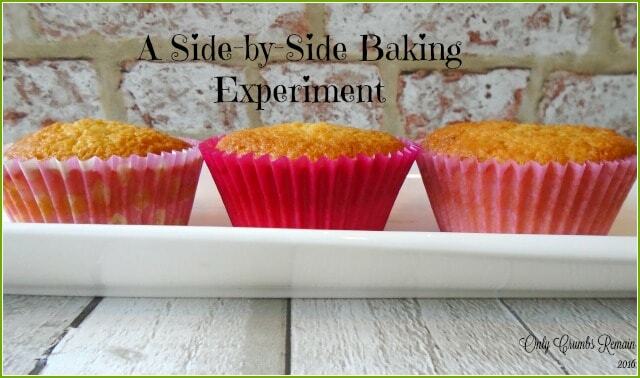 Love this side by side experiment! I've always used 'cheap for cooking, quality for eating' as a mantra, but I'll take a step back and rethink this now! Especially in things like cakes and pastry like you said, where butter is an important flavour factor. I also smoke butter on wood for cooking – I'll need to spend a bit more on quality there as well I think! Thanks! Nor I Alison, I honestly expected there to be very little difference in terms of flavour in the baked cakes. I was also amazed that there was a subtle colour difference in the sponge too. This is really interesting! I've definitely heard that if you're going to splash out on one ingredient, it should be your butter – and that being said I plan to make banana bread tonight and have upgraded from Sainsbury's own to Lurpak for the occasion! Ooh that sounds like it'll be a tasty bake Hannah 🙂 I'm definitely going to be using slightly more expensive butters when I bake items for more special occasions.